The experiences of the boy in this book are completely different from my own, but the writing is so well done and the story is so compelling that I was right there with Ghost, cheering him on. 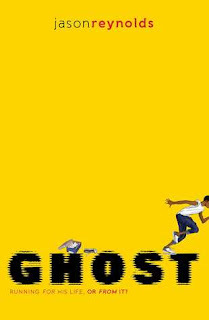 Ghost was written by Jason Reynolds and published by Simon and Schuster in 2016. It’s got strong, layered characters that take hold of your thoughts and make you want to keep reading to find out what’s going to happen to them. I don’t even like sports, but I was rooting for Ghost to succeed with the track team. Even more than that, I wanted him to deal with some of the issues in his life and have a feeling of safety where he could discover himself and his strengths. This is a fast read, and an emotional story that is hard to put down. One of the great things about this book is that it’s the first book in a series! Looking forward to reading the next one. This is a great book to study if you’re writing a novel with a first person perspective. The main character has a strong, consistent voice and all the details fit with his point of view. This book provides opportunities for class discussions about issues related to race and class, stealing, gun violence, bullying, and how to find ways to deal with strong emotions like anger. This book has many layers and at the same time, will keep student interest because of the focus on track and the short chapters. Sounds like a great story, and I think a lot of kids will relate to the sports theme. I'll have to remember this if I ever try to write in first person. I've heard so much buzz about this book, it's already on my TBR list. Thank you for your insightful review (and for sharing that amazing opener!). As much as I've read about this book, I didn't realize it was the first in a series. Cool. I was excited to find out there was going to be another book too! I really want to read this book. I've heard so many positive things about it and it won the Cybils. I always enjoy your reviews as you tell me why I want to read a book. Yes, it's a great one. Excellent review, too!